It was a humid afternoon. Two of my girlfriends and I decided to catch up at Riley Street Café, a small café positioned near the intersection of Riley and Campbell Street in Surry Hills. Riley Street Café is simple. If you’re feeling easy, breezy - come for lunch. If that’s too quiet for you, then I’m sure the bustling atmosphere of the after work crowd would make a perfect spot for dinner. The dinner menu tends to hold a larger variety of eats - predominately cheese, bread and meat. The menu is quite limited compared to your usual ‘café.’ But then again, Riley Street Café isn’t exactly a café. It’s more of a wine bar. The wine list is quite extraordinary and so it should be, considering the venture is run by ex-Bloodwood sommelier Gabrielle Webster. Webster has carefully crafted a versatile wine list that includes some of her personal favourites. One section labelled ‘POR’ (Price on Request) is an assortment of her most treasured, and it's obtainable to anyone who is capable of engaging in a conversation about the wine. It’s a daunting task to take on. Lunch was accompanied by a glass of the 2012 Artemis Riesling from the Southern Highlands in New South Wales ($9.00), and a negroni ($15.00). The Riesling wasn’t too sweet and complimented our lunch beautifully. My friend’s negroni was thoughtfully crafted and surprisingly refreshing. 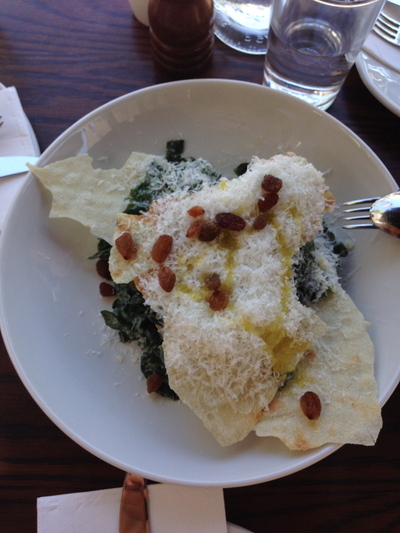 Lunch started with a not-so simple ‘simple salad’ with cavolo nero (fancy name for black leaf kale), dried currents & herbed garlic bread crumbs, dressed in a lemon, creamy garlic anchovy sauce and parmesan ($11.00) accompanied with a side of poached eggs. This was a great way to start our meal; it was decedent and light, and complimented the beverages nicely. This was shortly followed by another salad; this time with spring tomatoes, Liguria olives, cow’s milk ricotta, capers, oregano and basil dressed in white balsamic and olive oil ($10.00). In this dish I found the cow’s milk ricotta was quite rich and too overbearing, but nevertheless it was still enjoyable, and we finished the plate. 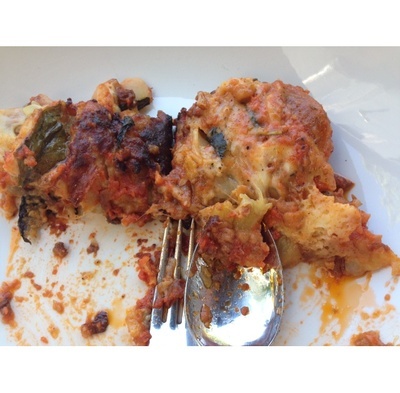 The ‘Eggplant parmigiana’ ($18.00) was most definitely the highlight of the afternoon. It was creamy and soft with the flavours intermeshing nicely. It was one of the ‘specials’ of the day. We were literally fighting over who got the last piece. We finished with the ‘Quinoa and Soybean’ sourdough ($7.00) coated with ‘Francesco’s scrumptious strawberry compote’ and butter. 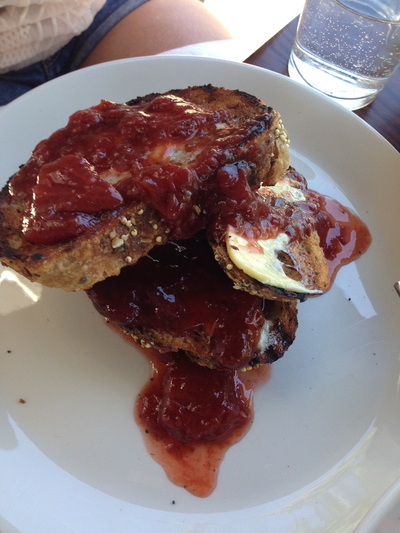 It was $2.00 for the spread that I thought was slightly unnecessary, however they compensated for this by providing big thick chunks of toast smothered in the compote. It was surprisingly filling and practically a meal in itself. The coffee’s cheap too. Four bucks got me a large, smooth, soy cappuccino. For a wines and a late lunch, it wasn’t a bad spot. Where: 222 Riley Street, Surry Hills NSW. Why: For an awesome lunch experience. Cost: From $10.00 to $50.00.